Sunburn occurs due to the damaging ultraviolet rays of the sun. Excessive exposure to UV light can cause the skin to become red, irritated, and painful. It also increases the risk of melanoma. How soon your skin develops sunburn depends on various factors – the skin type, the duration of exposure, and the intensity of the sun. 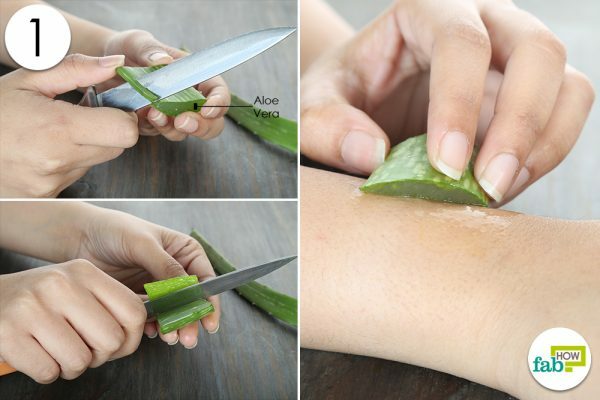 Single-Step Treatment: Cut the aloe vera leaf into pieces and rub over the affected area. Step 1. Prepare a double boiler and put in the aloe gel and extra-virgin coconut oil. Step 2. Remove the bowl from heat and add the remaining ingredients. Step 3. Transfer the mixture in a spray bottle and use. Step 1. 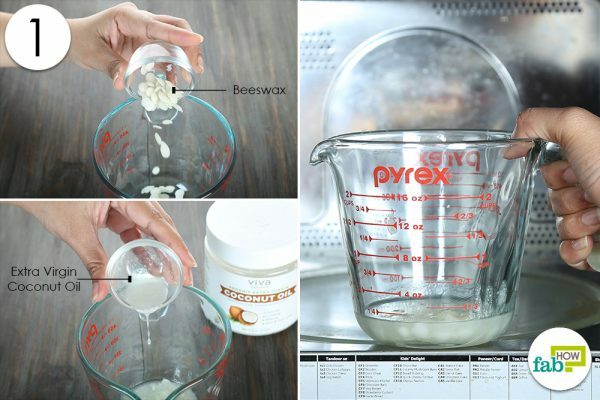 Melt the beeswax and coconut oil in the microwave. Step 2. Add in rest of the ingredients. You do not always notice the signs and symptoms immediately. It may take a few hours for a sunburn to appear. The health and beauty benefits offered by aloe vera are not a secret. Loaded with vitamins (A, B6, C, and E), magnesium, sodium, zinc, potassium, copper, and other essential nutrients, this ingredient can do wonders to damaged skin. It also contains anti-inflammatory, antipruritic, and antibacterial properties and offers soothing and moisturizing benefits. Aloe vera is effective in fighting the signs of aging, treating dryness, reducing acne breakouts, healing minor wounds and burns, and improving the overall health of your skin. It is often called the “burn plant” owing to its effectiveness in healing and treating all kind of burns. Aloe vera can help relieve various symptoms associated with sunburn and support the healing process. Here are a few ways in which you can use aloe vera to heal a sunburn. 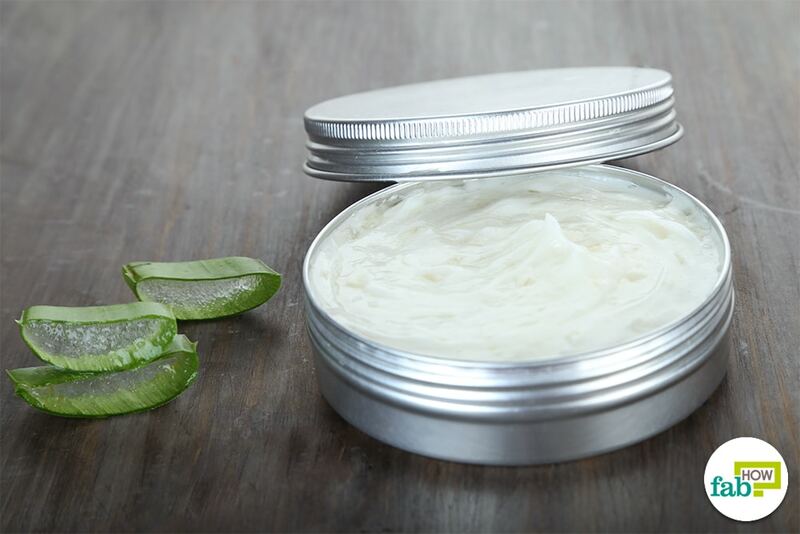 Aloe vera gel, the thick, jellylike substance found in the inner part of the plant’s leaf, is one of the most effective remedies for soothing and healing sunburnt skin. It can be applied directly on burns as it helps the damaged skin heal faster by preventing the UV-induced immune suppression. The glycoprotein present in the gel is useful in relieving inflammation and reducing pain and swelling, whereas its polysaccharides aid in repairing damaged skin cells and promoting the formation of new cells. When applied to burnt and peeling skin, aloe forms a protective layer that holds in moisture and keeps skin hydrated. Auxins and gibberellins, hormones found in the aloe gel, also support the healing process and offer anti-inflammatory benefits. Cut the aloe vera leaf into smaller pieces. Now use the knife to remove the skin from the side edge of the piece. Also, remove the skin from the bottom edge. Alternatively, you may also apply aloe vera gel cubes to soothe sunburnt skin. All you need to do is pour in freshly extracted aloe vera gel into an ice tray and freeze overnight (or as long as it takes). Once the aloe gel cubes are frozen, pop them out of the tray, and use them immediately. In instances where you want to store the aloe gel cubes for an extended period, place them in a storage bag and put them in the freezer. The frozen aloe gel will stay suitable for use for about 2 to 3 months. Rose water, created by distilling the petals with steam, is commonly included in beauty and skin care routines all around the world. It offers antioxidant, antibacterial, antiseptic, emollient, toning, cleansing, anti-aging, and anti-inflammatory benefits. It can be very effective in reversing the skin damage caused by the sun and also aids in soothing and healing sunburnt skin. 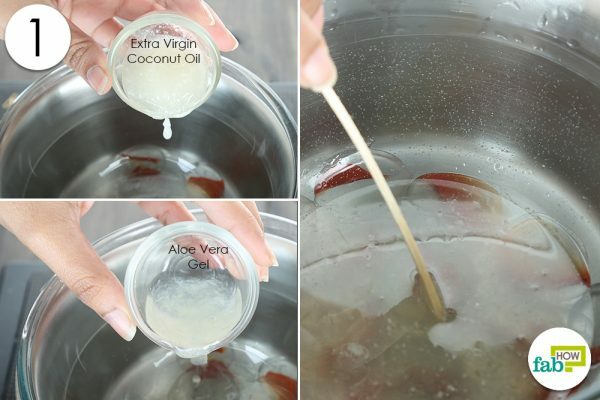 Extra-virgin coconut oil is a powerful ingredient, capable of meeting the various needs of your skin. It is commonly used in commercial skin and hair care products as well as natural skin care remedies. It is a powerful moisturizer and possesses antioxidant, anti-inflammatory, and antimicrobial properties. It is used in repairing damaged and dry skin, fighting signs of aging, lightening blemishes and scars, and evening out the skin tone. It offers natural sun protection and helps in preventing and healing sunburn. This ingredient is believed to be useful in blocking the effects of harmful UV radiation. Its fatty acid content plays a role in reducing skin inflammation and revitalizing the skin. Lavender oil boasts anti-inflammatory, antimicrobial, antiseptic, antibacterial, and antifungal benefits. It is quite popular in the beauty industry and offers several skin care benefits. The soothing and cooling peppermint essential oil offers some health and skin care benefits as well. It possesses anti-inflammatory, antimicrobial, antiseptic, expectorant, and astringent properties and can soothe inflammation and pain. 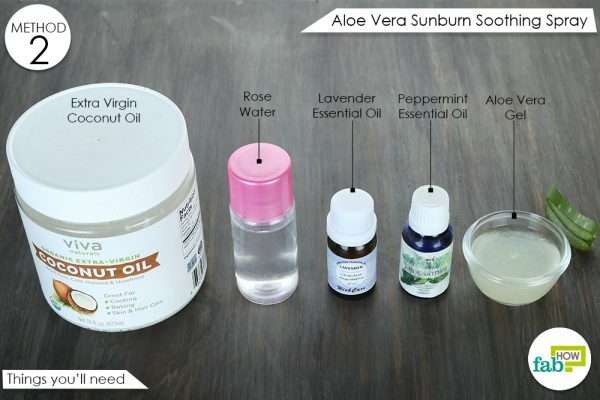 These ingredients, along with the healing aloe vera gel, make the perfect remedy to heal a sunburn. Keep the heat to medium. Add in 2 tablespoons of aloe vera gel. Remove the bowl off the heat once the ingredients are liquefied and well mixed. 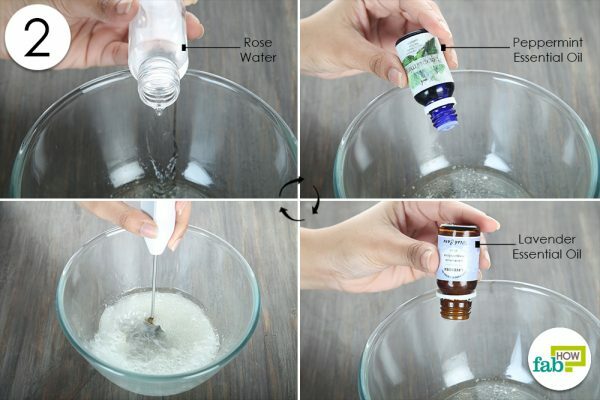 Add in 2 tablespoons of rose water. Add in 5 drops of peppermint and lavender essential oils. Use an electric hand blender to mix the ingredients. Use a funnel to transfer the mixture into a spray bottle. 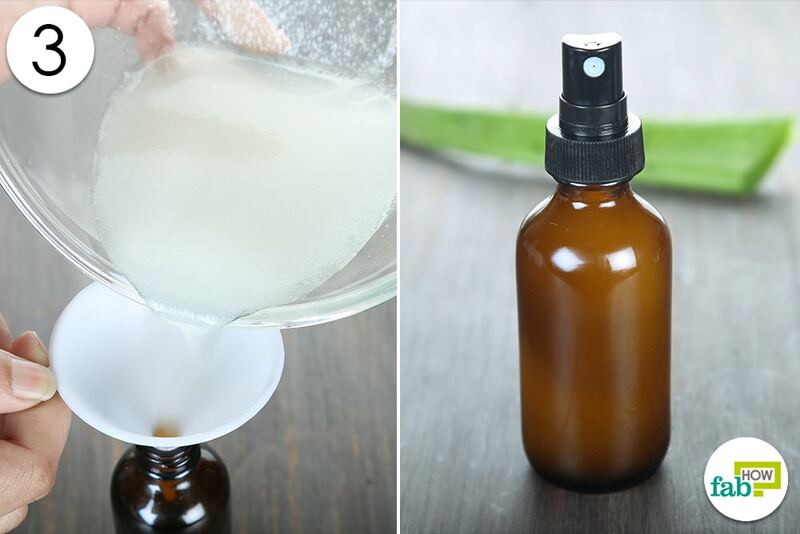 Your aloe vera spray is ready for use. Store the spray in a cool, dry place. Use the aloe vera sunburn soothing spray over the affected area for instant relief. Jojoba oil has hydrating, moisturizing, and healing properties. With the presence of essential nutrients, especially vitamins B, C, and E, jojoba oil helps keep the skin looking healthy and young. It helps retain moisture, reduces the signs of aging, offers sun protection, and is also used for removing makeup. This ingredient aids in healing sunburns as it travels deep into our tissues, thus soothing sunburnt skin and relieving the pain and inflammation. It will shield the skin while it heals and repairs by forming a waxy coating over it. Beeswax is used as a base ingredient in various commercial and DIY beauty and skin care solutions. It forms a protective barrier over the skin, locking in the moisture and keeping away the effects of toxins and irritants. Beeswax is loaded with antioxidants and vitamin A and plays a role in promoting skin cell regeneration and maintaining health and texture of the skin. Powered by its antibacterial and emollient features, coconut oil is fantastic for dry and dull skin. 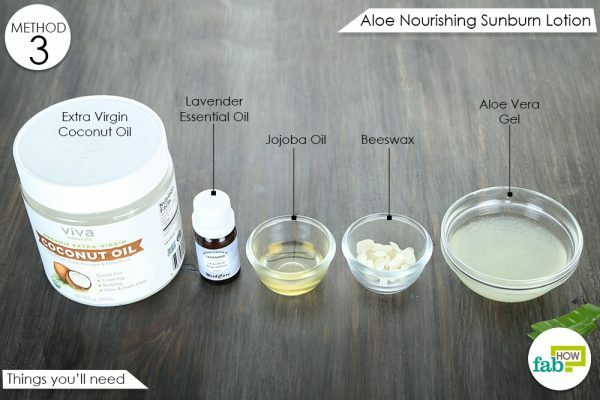 Combine these ingredients with aloe vera gel and add in a few drops of lavender essential oil to make an effective remedy for the sunburnt skin. Put together 2 tablespoons of extra-virgin coconut oil and 1 tablespoon of beeswax pastilles in a glass jar. Place the jar in a microwave for a few seconds. Make sure that the beeswax and extra-virgin coconut oil melt completely. 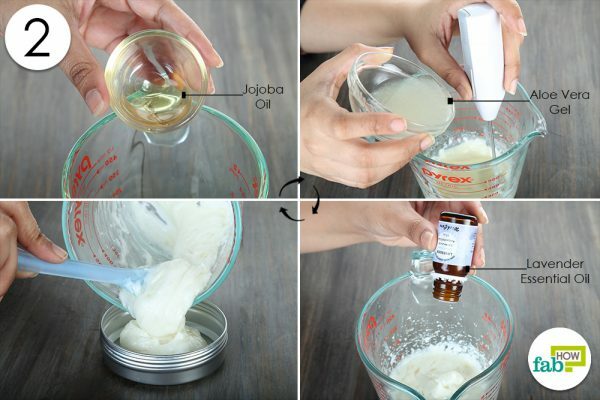 Add ½ tablespoon of jojoba oil to the extra-virgin coconut oil and beeswax mixture. Now, slowly add 4 tablespoons of aloe vera gel while simultaneously mixing the mixture with a hand blender. Keep the hand blender on low. Stop occasionally to ensure that the contents combine properly. Add a few drops of lavender oil. The mixture will solidify on cooling down. Transfer the mixture into a container. Your aloe nourishing sunburn lotion is ready to be used. Use this lotion regularly on affected areas to heal and protect burnt skin. To increase the shelf life of your aloe nourishing burn lotion, keep some of it in a small container with you and store the rest in the refrigerator. It will stay suitable for use for about 3 to 4 months. It is always better to use freshly extracted aloe vera gel for home remedies. 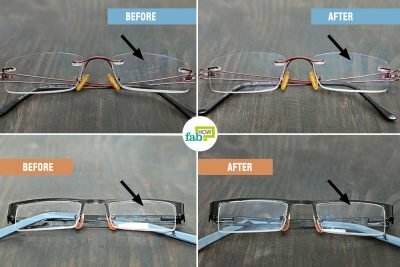 Here is how you can obtain the gel from aloe vera leaves. Newly extracted aloe gel will stay well in the refrigerator for about one week. Place aloe vera extract or gel in the refrigerator for a few minutes before application. This will help cool the sunburnt skin and relieve symptoms like stinging and itching. Lotions and creams with petrolatum must also be avoided. Petrolatum may aggravate the pain by trapping the heat within the damaged skin. Carry out a patch test to ensure that the remedies are suitable for your skin. The sun is the strongest between 10 a.m. and 4 p.m. Avoid sun exposure during these hours. Proper clothing, wide-brimmed hats, and sunglasses will also help keep you protected from sunburns. Never leave home without your sunscreen. Reapply it several times a day. Baking soda, black tea, oatmeal, apple cider vinegar, cold compresses, and honey are few other natural solutions for treating and soothing sunburnt skin. Treating sunburn. Employment and benefits | American Academy of Dermatology. https://www.aad.org/public/kids/skin/skin-cancer/treating-sunburn.